JOE LYCETT: £22, 8pm The Hawth Theatre, Crawley (01293) 553636. I’m About to Lose Control and I Think Joe Lycett. KRATER COMEDY CLUB: Until April 29, 7pm/8pm/10.30pm, £5-£36.50 Komedia, 44-47 Gardner Street, Brighton 0845 293 8480. ILLUSTRATED TALK: ‘A Passion for Piers!’ by Jackie Marsh-Hobbs, Cyprus Hall, Burgess Hill. Jackie is a Brighton historian, lecturer and Royal Pavilion guide. She will take a nostalgic look at the history of piers and seaside entertainments, focussing on some of the 100 pleasure piers that have been built around the British Isles. Talk starts 7.45pm. Admission £3 including tea, coffee and other refreshments. Event hosted by Burgess Hill Horticultural Society. To find out more and to reserve tickets call 01444 245509 or visit www.burgesshillhorticulturalsociety.com. LEWES RIVERSIDE CLUB: West Country Show by Alan Hodges, 2pm St Thomas’ Church Hall, Cliffe, Lewes. SEAFORD COMMUNITY CINEMA: Barn Theatre, Saxon Lane, 7.30pm. Eric Clapton: My Life in 12 Bars, cert 15. Tickets £6,£5 or £3.50. Available from Seaford Tourist Information Centre, 37 Church Street, 01323 897426. WALK: 2 ½ mile, flat, circular HDC Health walk along bridleways, country lanes and Downs Link. Meet 11am in the Country Park car park (off Cripplegate Lane), Southwater, RH13 7UN. Can be muddy. 1¼ hours. Dogs on a lead. Parking charge £1.50 for 3 hours. Jill 07780 701184. 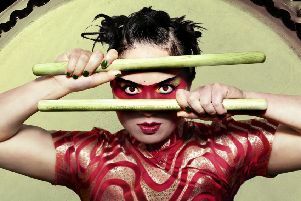 AKASHA: £10, 7pm Komedia, 44-47 Gardner Street, Brighton 0845 293 8480. Akasha and Son of Ugly. GOOFER DUST: Free, 7pm Lewes Con Club, 139 High Street, Lewes 01273 473076. HIGH OCTANE JUNKIES: Railway Inn, Billingshurst, 9pm. RED DEER PEOPLE: £3-£5, 8pm Latest MusicBar, 14-17 Manchester Street, Brighton (01273) 687171. With very special guests Desire and Dog of Man. THE COLLECTIVE: The Shelley Arms, Horsham, 8pm. THE DEREK NASH ACOUSTIC QUARTET: £11-£12, 8pm Under Ground Theatre, Grove Road, Eastbourne 0845 680 1926. YOLANDA BROWN: Love, Politics, War. £18.50, 8pm The Royal Hippodrome, Eastbourne (01323) 802020. ANNIVERSARY GALA: £18, 7.30pm and April 28, White Rock Theatre, Hastings (01424) 462288. The Hastings Stage Studio’s 50th Anniversary Gala. CRIME UNDER THE SUN: £15-£17.50, 7.45pm and April 28, The Hawth Theatre, Crawley (01293) 553636. New Old Friends Theatre Company. LILLIES ON THE LAND: Friday and Saturday, April 27-28. ACE Theatre Company presents Lilies on the Land by The Lions Part, The King Edward Hall, High Street, Lindfield. A funny and wonderfully moving play based on the real lives of the Women’s Land Army. Friday at 7.30pm and Saturday at 3pm and 7.30pm. Tickets £10 (concessions £8) from www.tickettailor.com/events/acetheatre or Chrissie White on 01342 893010. This is an amateur production by arrangement with Nick Hern Books. PAUL GASCOIGNE: £35, 7.30pm Pavilion Theatre, Marine Parade, Worthing 01903 206206. My Life In My Own Words. FUNNY WOMEN: Brighton Nights. 8pm Komedia, 44-47 Gardner Street, Brighton 0845 293 8480. Headliner Cally Beaton, MC Thanyia Moore. BALLROOM DANCE: Croft Hall, Burgess Hill School Girls’ School. £6 on door, includes refreshments. Ballroom, latin, jive, sequence. 8pm, doors 7.45pm. New dancers always welcome. Large sprung floor, soft lighting, on-site parking. Details 07767 411115, 01444 248926, strictlydancemagic@gmail.com, www.strictlydancemagic.co.uk. EARTH TO EARTH: A Talk on the natural history of churchyards by Stefan Buczacki, doors 2.30pm, St Andrew’s Church, Alfriston, £7.50 including a glass of wine or a soft drink. Tickets available at Much Ado Books, 8 West Street, Alfriston, or www.muchadobooks.com. Ticket sales will benefit the St Andrew’s Restoration Fund, as will £3 from every copy of the £15 book sold. Stefan Buczacki’s book (Earth to Earth: A Natural History of Churchyards) uncovers the wild animals and plants that thrive among headstones, from the graveyard beetle to the mighty yew. It also explores the history of churchyards and the landscape. QUILT EXHIBITION: Art show and children’s art workshops, 10.30am-4.30pm. Quilt and art show also on April 29, 12pm-4pm. Both events are St Margarets Church, Coles Lane, Ockley, free admission, refreshments available. SEAFORD COMMUNITY CENTRE: Barn Theatre, Saxon Lane. 2.30pm, Battle of the Sexes, cert 12A. Tickets £6,£5 or £3.50. Available from Seaford Tourist Information Centre, 37 Church Street, 01323 897426. CRASH ’N’ BURN: The Malt Shovel, Horsham, 8.30pm. DAVE TWANG: Free, 10am-noon at the regular coffee morning, Under Ground Theatre, Grove Road, Eastbourne 0845 680 1926. Dave Twang then Andy Drudy. HORSHAM ROCKS PRESENTS: Simon Jones, The Carfax Bandstand, Horsham, 2pm-4pm. ITALIAN FOLK SONGS AND ARIAS: Vocal Recital. Free, 6pm St Michael’s Church, High Street, Lewes. KING SIZE SLIM: £7-£9, 7.30pm Under Ground Theatre, Grove Road, Eastbourne 0845 680 1926. Toby Barelli. LEWES SATURDAY FOLK CLUB: £6, 8pm Elephant and Castle, Lewes. Nick Dow singing and playing English traditional songs. THE SLAMMERS: The Roffey Club, Roffey, 7pm. TUNES AND TEA: Featuring the Perdido Players Swing Band. A tribute to Ella Fitzgerald, 3pm, Lindfield United Reformed Church. Admission is free and there will be refreshments. Any donations received after expenses will be passed to St. Peter and St James Hospice to help support the work of the Community Nurses. Info: Peter Swann 01444 450335, www.perdidoplayers.co.uk. CHAMPIONS OF MAGIC: £35.70, 6.30pm Brighton Centre 0844 8471515. With their new world tour. CHARITY CONCERT: £18-£24, 7.30pm Pavilion Theatre, Marine Parade, Worthing 01903 206206. With Richard Jones. PETER ANDRE: £27, 7pm The Hawth Theatre, Crawley (01293) 553636. An Evening With Peter Andre. BEACHY HEAD RAMBLERS: Ditchling and Clayton Windmills, 11 miles with Emma T 07864 587043. Meet at Ditchling car park, 10am. NUTLET WINDMILL: Crowborough Road, TN22 3HY, open 11am-5.30pm, admission free but donations welcome, parking at Friends car park with a pleasant ten-minute walk from rear down forest to the mill. Info: 01435 873367. Also Wednesdays 11am-3pm. SPRING WALK AND CREAM TEA: Start at Plumpton College Equestrian Centre, 2pm, £5 adults (children under 14 free). Please wear suitable footwear as paths can be muddy. Walk led by Reg Lanaway. All proceeds to St Peter and St James Hospice. Tea at The Half Moon. WALK: Meet 10.30am, Leechpool Wood car park, Harwood Road, Horsham. 2 ¼ mile HDC Health walk. Some inclines, tree roots, uneven ground. Can be muddy. Dogs on a lead. 1 ¼ hours. Armelle 01403 260342. CORELLI ENSEMBLE: £10-£12, 4pm St Pancras Church, Irelands Lane, Lewes. Soloist Sebastian Comberti, cello. Tickets from corelliensemble.co.uk or on the door. QUATUOR AROD: £16-£18.50, 11am Brighton Dome (01273) 709709. Coffee Concerts 2017/18. RTW CHORAL SOCIETY: 310, 3pm Assembly Hall Theatre, Tunbridge Wells (01892) 530613. Bernstein and Rutter. THE PASADENA ROOF ORCHESTRA: £22-£25, 4pm The Royal Hippodrome, Eastbourne (01323) 802020. Vivace choir: St Marks Church, Horsham, 4pm. In support of The Phoenix Stroke Club. Tickets £10 from The Phoenix Stroke Club, 01403 268130. AMERICANA LIVE: Free, 1pm The Hawth Theatre, Crawley (01293) 553636. An afternoon of the best of Americana. MONEY FOR NOTHING: The Capitol Theatre, Horsham, 7.30pm. StAN’S SHOWCASE: 7th Anniversary Special, The Anchor Hotel, Horsham, 7pm. TALITHA RISE: Free, 3.30pm Lewes Con Club, 139 High Street, Lewes 01273 473076. Sundays In The Bar. THE VAMPS: From £13.95, 6.30pm Brighton Centre 0844 8471515. Night and Day Tour. LA TRIVIATA: £21.50-£35, 7.30pm White Rock Theatre, Hastings (01424) 462288. Opera and Ballet International. WALK: Park and meet, 10.30am, St George’s Parish Church, Steyning Road, RH13 8LR. Flat 3 to 5 mile HDC walk over farmland. Bluebells and excellent views of the South Downs. No dogs. 2½ hours. Jean 07734 323321 or Jill 07780 701184. BRYDE: £8, 7.30pm Komedia, 44-47 Gardner Street, Brighton 0845 293 8480. Bryde and Lauran Hibberd. MARA SIMPSON: £10, 7.30pm Komedia, 44-47 Gardner Street, Brighton 0845 293 8480. With Soul of The City Choir. WHITNEY ROSE: £18, 7.45pm The Hawth Theatre, Crawley (01293) 553636. PAUL GAMBACCINI: 7pm, Theatre Royal, Brighton 0844 871 7650. One person show. DANCE CLASSES: Tuesdays, 8pm-9pm. Limon/release based dance class focusing on improving technique within the contemporary style whatever your experience. This class is for everyone, adults and young people. Drift Dance, Broadfield Youth and Community Centre, RH11 9BA. £6 per class. Info: drift.dance.contemporary@gmail.com. HORSHAM INDOOR BOWLS CLUB: Located at bottom of Tesco car park, Broadbridge Heath. Two free taster sessions on Tuesday evenings from 7pm, starting on May 1 and throughout the summer. No advance booking necessary. Free coaching available. Info: horshamdistrictindoorbowlsclub.co.uk. MID SUSSEX RAMBLERS: Woodland Walk and Tilgate Park, 7.5 miles with Peter R 01444 233952. Meet at the car park off B2110, 270 yards east of T-junction with B2036, 10.30am. A HAWK AND A HACKSAW: £12, 7.30pm Lewes Con Club, 139 High Street, Lewes 01273 473076. POPPY ACKROYD: £10, 7.30pm Komedia, 44-47 Gardner Street, Brighton 0845 293 8480. Composer, pianist and violinist. YOUNG MONARCH: £7, 7pm Latest MusicBar, 14-17 Manchester Street, Brighton (01273) 687171. Plus special guests. LA TRIVIATA: £18.50-£41, 7.30pm Theatre Royal, Brighton 0844 871 7650. Opera and Ballet International. MEET ME IN ST LOUIS: £20, 7.30pm until May 5 (Wed/Sat mat 2.30pm) Connaught Theatre, Union Place, Worthing 01903 206206. BEACHY HEAD RAMBLERS: Alfriston to Firle. There Along The Bottom and Back On Top, 11 miles with Liz F 07932 165259. Meet outside Alfriston Village School, North Street, 10am. GARDEN SOCIETY: Lewes and District Garden Society talk, Hardy Geraniums by Tom Stone, 7.30pm for 7.45pm St Thomas’ Church Hall, Cliff, Lewes. LEWES ASTRONOMERS: The Life Cycle of Stars by Bob Turner (Worthing Astronomers), 7.30pm the Lecture Room, Lewes Town Hall (Fisher Street entrance). All welcome, non-members £3. LEWES FOOTPATHS GROUP: Berwick to Polegate, A Woodland and Water Walk, 6 miles with rosemary and Sandra 07784 707016 (picnic lunch). Meet at Lewes Railway Station 10.09am train to Berwick. WALK: Meet 10am, car park at the Black Horse public house, Nuthurst, RH13 6LH. 5-mile HDC walk, a few stiles through woods and across farmland. No dogs please. 2¼ hours. Mike 07855 502023. BEANS ON TOAST: £15, 7.30pm Komedia, 44-47 Gardner Street, Brighton 0845 293 8480. Sitting On A Chair Tour. KEEP IT COUNTRY: £23.50, 7.30pm The Hawth Theatre, Crawley (01293) 553636. Toe-tapping Country music. WUTHERING HEIGHTS: £26, 7.30pm Devonshire Park Theatre, Eastbourne (01323) 412000. The music of Kate Bush. FORBIDDEN BROADWAY: £12, 7.30pm and May 3, Chequer Mead, East Grinstead (01342) 302000. East Grinstead Operatic Society. MADAMA BUTTERFLY: £18.50-£41, 7.30pm Theatre Royal, Brighton 0844 871 7650. Opera and Ballet International. THE SPACE: £15, 8.30pm Latest MusicBar, 14-17 Manchester Street, Brighton (01273) 687171. Singe/songwriter Chris Difford and film producer Anthony Waye. BILL BAILEY: £27.50, 7.30pm and May 4, Assembly Hall Theatre, Tunbridge Wells (01892) 530613. Larks in Transit. COMEDY NIGHT: £8-£10, 8pm Lewes Con Club, 139 High Street, Lewes 01273 473076. Adam Bloom, Daniel Muggleton and Joe Wilkinson. BEACHY HEAD RAMBLERS: To See A Long Man, 5 miles with Esther and John 07761 615671. Meet at Wannock Village Hall, Jevington Road, 6.30pm. CHARITY FASHION SHOW: In aid of the Children’s Respite Trust, 7pm Kings Church State Hall, Heathfield. Tickets £10 available from local businesses or online through EventBrite. MID SUSSEX RAMBLERS: Sussex Diamond Way Stage 2, 9.5 miles with Paul J 01444 441530. Meet at Kingspit Lane between A283 and A272, 10am. POLEGATE RAMBLERS: Horam Fishing Lakes and Woods, 2.25 miles with Sue T 482441. Meet at Medical Centre, 9.47am bus 51 Firle Beacon, 4.7 miles with Betty 640663. Or, Rushlake Green and Beyond, 8.5 miles with Mick 486756. Meet at Wannock Road Recreation Ground, 9.30am. BONEY M: £29.50, 7.30pm The Hawth Theatre, Crawley (01293) 553636. Featuring Maizie Williams. SEVEN DRUNKEN NIGHTS: £20.50-£26.50, 7.30pm Theatre Royal, Brighton 0844 871 7650. The Story of The Dubliners. THE DRIFTERS: £23.50-£25.50, 7.30pm White Rock Theatre, Hastings (01424) 462288. Duke Of York’s (0871 902 5728): Dementia Friendly Screening: Gigi (PG) Fri 11.00. Kids’ Club: Tad The Lost Explorer And The Secret Of King Midas (U) Sat 10.30. Vintage Sundays: Persona (15) Sun 12.00. Discover Tuesdays: The Wound (15) Tue 1.00. Exclusive Premier Screening: Nothing Like A Dame (tbc) Wed 6.30. Orion (01444 243300): Avengers: Infinity War (12A) Fri 4.30, 7.40; Sat & Sun 1.00, 4.30, 7.40; Mon-Thu 5.00, 8.00. Avengers: Infinity War – 3D (12A) Fri, Sat & Sun 8.00. Rampage (12A) Fri, Sat & Sun 5.00; Mon-Thu 5.15, 8.30. Peter Rabbit (PG) Sat & Sun 2.30. New Park (01243 786650): Phantom Thread (15) Fri 12.45; Sat 6.00; Sun 3.00; Mon 3.30; Wed 12.30; Thu 8.15. Journeyman (15) Fri 3.30; Sun 5.45; Mon 6.15. Wonderstruck (PG) Fri 5.45; Sat 8.45; Sun 12.30; Mon 1.00; Tue 6.00; Wed 8.30; Thu 3.30. A Gentle Creature (15) Fri 8.15; Tue 3.00. Thriller (PG) Sat 10.00. The Bachelors (15) Sat 12.00; Tue 12.45; Wed 6.15; Thu 6.00. RSC 2018: Macbeth (PG) Sat 2.15. 120 BPM (Beats Per Minute) (15) Sun 8.00; Wed 3.15. The Silence Of The Lambs (18) Mon 8.30. The Life Aquatic With Steve Zissou (15) Tue 8.30. Finding Your Feet (12A) Thu 1.00. Arts Centre (01483 278000): Roman Holiday (U) Sat 2.00. ROH Live: Manon (12A) Thu 7.15. Curzon (01323 731441): The Guernsey Literary And Potato Peel Pie Society (12A) 2.00, 5.00, 8.00. The Leisure Seeker (15) 2.05, 5.05, 8.05 (not Wed). A Quiet Place (15) 5.10 (not Wed); 8.10. Darkest Hour (PG) Fri, Mon, Tue & Thu 2.10. Peter Rabbit (PG) Sat & Sun 2.10. The Party (15) Wed 2.10, 5.10, 8.10. Scott Cinemas – The Atrium Cinema (01342 321666): Rampage (12A) 8.30 (not Sat); Sat 2.30. The Leisure Seeker (15) Fri, Mon, Tue & Wed 1.00, 3.30, 6.00; Sat 8.10; Sun 6.00; Thu 1.00, 3.30. Peter Rabbit (PG) Sat & Sun 1.05, 3.30. Avengers: Infinity War (12A) 12.50, 4.25, 8.00 (not Sun); Sun 12.40, 4.10, 7.30. The Guernsey Literary And Potato Peel Pie Society (12A) Fri & Sun-Wed 2.15, 5.15, 8.15; Sat 5.15; Thu 2.15, 5.15. Kids Crew: Coco (PG) Sat 10.10. Kids Crew: Ferdinand (U) Sat 10.10. Kids Crew: Early Man (PG) Sat 10.10. Metropolitan Opera: Cendrillon (12A) Sat 5.55. Royal Opera House: Manon (12A) Thu 7.15. Pavilion (01323 841414): Movie Make Memories: Top Hat (U) Fri 2.00. Black Panther (12A) Fri, Sat & Sun 7.45. Kids 4 A Quid: Sat 2.15. Autism Friendly Screening: Coco (PG) Sun 10.30. Coco (PG) Sun 2.15. The Mercy (12A) Mon & Tue 7.45; Wed 2.15, 7.45; Thu 2.15. Royal Opera House: Manon (12A) Thu 7.15. The Capitol (01403 750220): The Guernsey Literary And Potato Peel Pie Society (12A) 2.15, 5.15; 8.15 (not Sat). Avengers: Infinity War (12A) Fri 1.15, 8.00; Sat 2.00, 8.00; Sun 1.00, 1.45, 4.30, 5.45; Mon & Tue 4.30, 5.45, 8.00; Wed 1.15, 5.45, 8.00; Thu 4.30, 8.00. Avengers: Infinity War – 3D (12A) Fri & Wed 4.45; Sat 10.15; Sun 8.00; Mon 1.15. Blue Oasis Screening: Avengers Infinity War (12A) Sat 11.00. Metropolitan Opera Live: Cendrillon (Massenet) (12A) Sat 5.55. Players Theatre/Hurst Village Cinema (01273 835875): The Other Side Of Hope (12A) Thu 8.00. Windmill Cinema (01903 715920): Peter Rabbit (PG) Sun 12.00. The Greatest Showman (PG) Sun 2.00. Royal Ballet: Manon (12A) Thu 7.15. Seaford Community Cinema, Barn Theatre (www.seafordcinema.org): Eric Clapton: Life In 12 Bars (PG) Fri 7.30. Battle Of The Sexes (12A) Sat 2.30. The Picture House (01825 764909): Nothing Like A Dame (12A) Wed 8.15. Avengers: Infinity War (12A) Fri & Mon 11.15, 2.00, 5.05, 8.10; Sat 11.00, 2.00, 3.20, 5.05, 8.10; Sun 11.00, 2.00, 3.10, 5.05, 8.10; Tue 2.00, 5.05, 8.10; Wed 11.00, 2.10, 5.10, 8.10; Thu 2.10, 5.10, 8.10; Parent & Baby Screening: Thu 11.00. The Guernsey Literary And Potato Peel Pie Society (12A) Fri 2.15, 6.00, 8.30; Sat 2.35, 8.30; Sun 3.30, 6.00, 8.30; Mon 11.00, 2.15, 6.00, 8.30; Tue 11.10, 2.15, 6.00, 8.30; Wed 11.10, 1.30, 5.45; Thu 2.00, 6.00; Parent & Baby Screening: Thu 11.10. The Leisure Seeker (15) Fri, Tue & Wed 4.00, 8.35; Sat 1.00, 9.20; Sun 1.10, 6.05; Mon 1.30, 6.05; Thu 8.35; Parent & Baby Screening: Thu 11.20. Funny Cow (15) Fri & Tue 1.45, 6.20; Sat 6.20; Sun 1.00, 8.25; Mon 3.55, 8.25; Wed 11.20, 6.20; Thu 4.30. Peter Rabbit (PG) Fri 11.30; Sat 10.45, 12.35; Sun 11.00; Thu 1.45. The Greatest Showman (PG) Fri 11.15; Sun 10.45; Thu 3.45. Saturday Morning Movie: Ferdinand (U) Sat 10.30. Metropolitan Opera Live: Cendrillon (12A) Sat 5.55. Royal Shakespeare Company Encore: Macbeth (12A) Wed 2.00. Royal Opera House Live: Manon (12A) Thu 7.15. Dome (01903 823112): Avengers: Infinity War (12A) Fri 1.00, 4.25, 8.00; Sat & Sun 10.00, 1.10, 4.35, 8.00; Mon 11.45, 4.25, 8.00; Tue, Wed & Thu 1.00, 4.20, 7.45. Parent & Baby Screening: The Guernsey Literary And Potato Peel Pie Society (12A) Mon 12.00. Peter Rabbit (PG) Sat & Sun 10.20. Rampage (12A) Sat & Sun 12.30. The Guernsey Literary And Potato Peel Pie Society (12A) Fri 12.30, 3.00, 5.45, 8.25; Sat & Sun 3.00, 5.45, 8.25; Mon 3.00, 5.45, 8.25; Tue-Thu 12.20, 3,00, 5.40, 8.20. Connaught (01903 206206): A Quiet Place (15) Fri 6.15; Sat 8.15. Ghost Stories (15) Fri 8.30; Sat 6.00. Avengers: Infinity War (12A) Fri, Tue & Wed 1.15, 4.30, 7.45; Sat & Sun 10.00, 1.15, 4.30, 7.45; Mon 1.30, 4.45, 8.00; Thu 12.15, 3.30. The Greatest Showman (PG) Fri 1.30; Sat 3.30. Peter Rabbit (PG) Fri 4.00; Sat 1.20. Saturday Morning Pictures: Peter Rabbit (PG) Sat 10.15. Silver Screen: Mary Magdalene (12A) Mon 11.00. Royal Opera House: Manon (12A) Thu 7.15.